Based at BMI The Saxon Clinic at Milton Keynes, our secretaries Karen and Zoe will assist you in making an appointment and, if necessary, in discussions with your insurance provider regarding authorisation for treatment. It is not absolutely necessary for you to have a referral letter. However, if you are insured, your insurance provider will usually require that you are seen by your GP first, and then referred to us prior to granting authorisation. Clinics are generally held Wednesday evening / Thursday morning and Friday afternoon. If you wish to be seen outside these times, specific arrangements can usually be made easily. 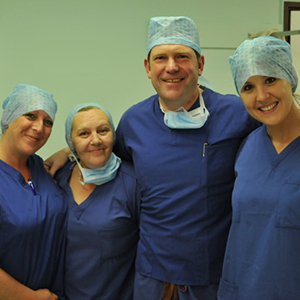 The great operating theatre team of Chrissie, Steph and Cheryl.